Labor Day is intended to honor working Americans. But six years after the financial panic that nearly sank the U.S. economy, it’s the millions of Americans who aren’t working, or working less than they want to, who pose a challenge to policymakers and are a major contributor to Americans’ persistently sour feeling about the economy. Although the official unemployment rate was down to 6.2% in July (figures from August are due out Sept. 5), many economists and other analysts have concluded that that measure doesn’t fully capture what’s happened to the U.S. economy since the Great Recession officially ended in the summer of 2009. 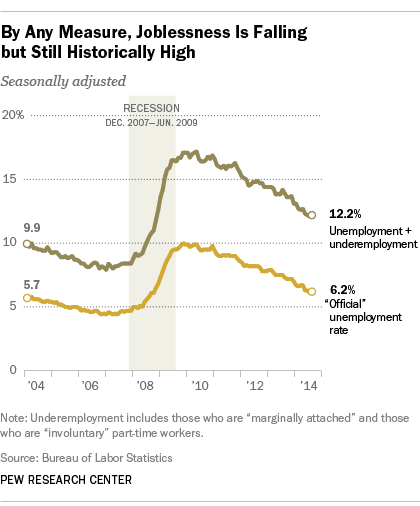 An alternate measure, dubbed U-6 by the Bureau of Labor Statistics, adds two more groups to the officially unemployed: people who are considered “marginally attached” to the labor force, in that they want and are available to work but haven’t looked for a job recently, and people working part-time for economic reasons rather than by their own choice (also called “involuntary” part-time workers). Including those two groups, labor economists say, produces a more comprehensive measure of “labor underutilization,” or underemployment. The U-6 measure was at 12.2% in July — 6 full percentage points higher than the official unemployment rate. Both the unemployment and underemployment metrics have fallen fairly steadily since late 2009/early 2010, but underemployment much less so. While the unemployment rate is back down to the high end of its pre-crash range, underemployment remains higher (after adjusting for seasonal variations) than at any point since the current measure was first introduced in 1994. All in all, 10.3 million Americans were counted as unemployed in July, and 9.8 million more were underemployed — either “marginally attached” or working part-time when they’d rather be full-time (or at least have more predictable schedules). That level of job insecurity is weighing on Americans: In a July Pew Research Center report, 62% said jobs were difficult to find locally (versus 29% who said plenty of jobs were available) and eight-of-ten rated the economy as “only fair” or poor. A new report from Rutgers University finds that just a third of Americans say the economy has improved over the past year, and even fewer (26%) expect it to improve over the next year; 71% say the Great Recession wrought permanent changes on the U.S. economy. Economists, as is their wont, disagree on how to interpret the un- and underemployment figures. Some, such as Alan Krueger of Princeton, have argued that the long-term unemployed are on the margins of the labor force and have little impact on the overall economy; John Silvia of Wells Fargo Securities has suggested that the declining trend in overall joblessness and underemployment are more significant than the actual levels. It’s hardly an academic debate. As long as the Federal Reserve sees “significant underutilization of labor resources,” as it stated in July, it’s likely to keep interest rates low. But should it conclude that labor conditions are tighter than they appear — with consequent upward pressure on wages and prices — rates could start heading higher.